The globalist elite feel they are in a new Cold War against Russia and Donald Trump is their agent. That delusion has culminated in the installation of a Special Counsel headed by former FBI director Robert Mueller. It has since transpired that Obama holdovers and shadow warriors in the deep state conspired to frame the elected Government of Donald Trump. Related: Steele Dossier, Uranium One, Hillary emails, House and Senate Russia investigations. UPDATE: Fresh from a 2 weeks' jail sentence George Papadopoulos emerged over the weekend at a MAGA conference where he sustained an interview with Mark Cernovich. Watch on C-Span. Nov. 22, 2018 Dan Bongino: the Biggest Scam in American History. The Papadopoulos interview. New developments abound about which more in the coming days. 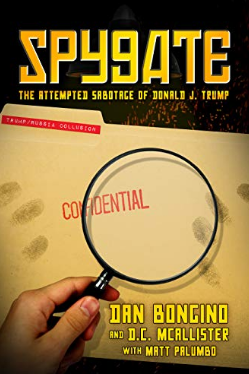 But in the meanwhile enjoy Dan Bongino's talk laying out the general Spygate story as the original plan A (Obamagate) carried over into plan B (Crossfire Hurricane) that necessitated plan C (Mueller's clean up operation). How this is going to end is as yet unknown, but Bongino has an inkling. Many are frustrated who want President Trump to declassify and expose the entire operation. But you have to put some trust in his intelligence. This is the only leverage he has against the Democrat House unleashes its investigations fest come January. Exposing the UK and Aussie roles in Spygate would complicate the situation further on the international level (Zerohedge). At this point we have to put our trust in President Trump's gut instincts and judgment, keeping in mind that the legal aspects are just a side show to what is essentially a political aim: getting the President out of office (as well as covering their own asses), prevent Trump's re-election in 2010 and preserve the swamp. Listen to Bongino about the FBI rate at the Clinton Foundation whistleblower. Bongino: "Is it a headfake? ", explaining that what we are seeing is a war (audio). Here are the latest developments without prejudice of it all means in the scheme of things. A mystery witness who has been fighting grand jury subpoena in Mueller probe since August will make his case to the Judge in secret hearing. Who could it be? The closed-door hearing is set for December 14 in the DC Circuit Court of Appeals. Case has remained under seal and little is known about the issues at hand. Some speculated that the mystery witness is Trump, but experts say it's unlikely. FoxNews: Mark Penn: The Mueller investigation has come up empty on Russia -- You won’t believe what's coming next. The Federalist: New Details Reinforce That The FBI Used Fake Pretexts To Start Investigating Trump. A third whistleblower on Uranium One is now speaking with John Huber and federal prosecutors! This is in addition to Cain, whose house was raided by 16 FBI agents Nov. 17th, and Campbell. Actually they are announcing what’s already happened. But they gotta publicly roll it out like this just happened now. Mueller's goal appears to be to coverup his collusion/actions with Russia on Uranium One. Many are missing why this is so chilling. The FBI raided the Clinton Foundation whistleblower’s home to recover the damning info on Mueller and the Clintons so that it wasn’t out there in the public domain. BREAKING NEWS: The Justice Department Inspector General’s report from earlier in 2018 detailed evidence that the Obama Justice Department had sought to shut down the FBI’s investigation of Clinton Foundation. Nov. 28, 2018 Sean Hannity Show entirely devoted to Mueller Special Counsel issues. UPDATE: This morning we woke up to the news that Michael Cohen pleaded guilty to lying to Congress. It looks like another process crime, this time in order to obtain a reduced sentence to unrelated issues. Apparently the negotiations with a Russian real estate broker about Trump Tower Moskou lasted longer than January 16, 2016 as stated to Congress. The negotiations between Cohen and the real estate broker fell through only in June 2016 when Trump pulled the plug. It doesn't appear to change anything for the situation with the Mueller Special Counsel. The Democrats will make the most of this, saying a new avenue of investigations has been opened up. Let's stick to the issue of Jerry Corsi and Roger Stone for the moment. Sean Hannity's show last night was entirely filled to the brim with interviews on the subject. Here's the thing with plea deals that Mueller is handing out like peppermints: the subject's confession does not necessarily have to be true; and moreover, it doesn't have to be a criminal action! On an earlier occasion Cohen pleaded guilty to a non crime! Corsi was offered a plea deal confessing to a lie! According to Rush Limbaugh, Mueller is trying to connect the real estate deal to the meeting Don Jr and a number of other campaign people had in Trump Tower with the Russian lawyer Veselnitskaya, which was in reality related to the Magnitsky Act under the false premise of "dirt on Hillary". Mueller's timeline has now connected the meeting in the summer of 2016 to the real estate negotiations. It is not a crime, but it doesn't need to be. It will suit the purpose of a political impeachment procedure just fine. The meeting in Trump Tower could well have been a Fusion GPS set up on behalf of Clinton and the Dems. Veselnitskaya met with Fusion GPS on the day prior to the meeting, and on the day after. Corsi on Hannity right now saying Mueller team tried to force him to lie. When he wouldn't, they threatened him with prison. Corsi is not playing ball with Mueller's band of merry gangsters: the e-book version of his "tell all" book is already available at Amazon. A number of people have wondered why the President hasn't declassified the FISA related documents. Apparently the Brits and Aussies implored him not to, but there's another reason. The President would lose leverage, which he is now prepared to put to good use. Mueller is using interrogation methods that are not even allowed. Posobiec working for OANN has the story. Watch also Scott Adams about the technique of planting false memories (from 12:00 minute). The story in The Guardian last Wednesday that Manafort met in London at the Ecuador Embassy with Julian Assange in 2013, 2015 and 2016 has collapsed. I’m ranting about the #Mueller investigation this AM because I’ve never seen anything this bad. Mueller calls people in, subjectively decides if their recollection of years old events is his version of the truth, then destroys their lives if they don’t do his vendetta bidding.